The good folks at Green Ronin Press are about to roll out the latest supplement to their SONG OF ICE AND FIRE rpg. This one is Night’s Watch. 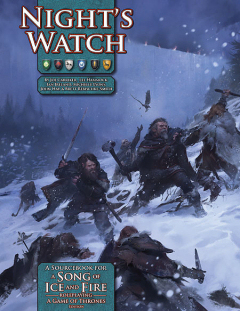 Night’s Watch gives you everything you need to add this once noble order to your A Song of Ice and Fire Roleplaying chronicle. It includes rules for playing men of the Night’s Watch and wildlings alike, as well as new information about the mysterious Others. Pray, men of the green lands, for Winter is Coming! So all you gamers out there, act now… defend the Wall. And expect the usual great art and exciting play. Available for pre-order from Green Ronin.